While the principles of spinning have remained unchanged throughout the ages, the implements for imposing the twist have evolved into the wheels we use today. 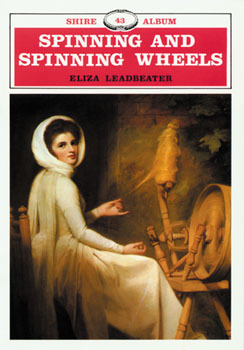 The book traces the development of the spinning wheel and explains the principles of spinning, the development of the spindles, wool wheel and flax wheel, and more. It also includes a sweeping survey of both European and North American wheels. Superbly illustrated with countless detailed black and white photos, this book will provide insight into the tools of a traditional skill from which today's craft revival has evolved. It will be a valuable source book for craftsmen, collectors and historians and the timeless information will delight and interest any reader.